Paravur landmass' 3 sides are surrounded by water bodies - Paravur Lake, Nadayara Lake and Arabian Sea. Both north and south tips of Paravur town is having peninsula and estuary. Thekkumbhagam is at south of Paravur. Thekkumbhagam estuary is the most crowd-pulling estuary in the state. 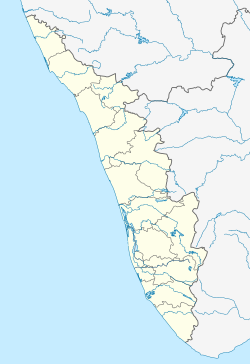 It is located at the borders of Kollam-Thiruvananthapuram districts. A beach in this location attracts crowds every day. The estuary can be accessed by travelling through Paravur-Kappil-Varkala road. Wikimedia Commons has media related to Thekkumbhagam. ^ "Estuaries Of India". Archived from the original on 3 April 2015. Retrieved 16 March 2015. ^ "Impact of Sea-Sand Filling in the Paravur-Kappil Backwaters, Southern Kerala with Special Reference to Phytoplankton Productivity" (PDF). Retrieved 16 March 2015. ^ Coastal Zone Management: By Ramakrishnan Korakandy. Retrieved 16 March 2015. ^ "Paravur-Pozhikkara-Thanni Road". Retrieved 16 March 2015.